Just a few sketches for such a busy month. Enjoying the unfamiliar view of familiar islands from Malibu. 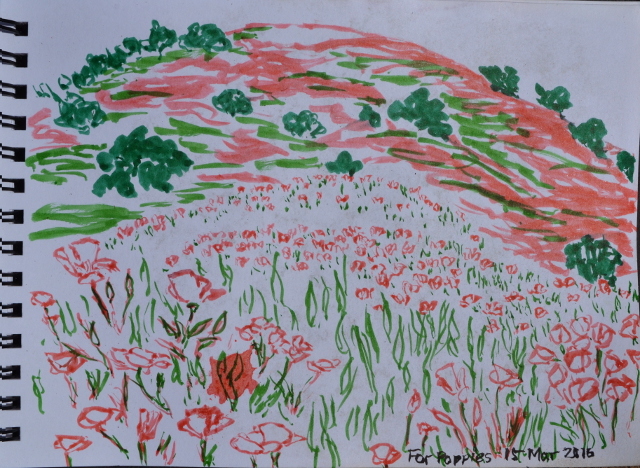 Nestled among the poppies on a mountain named for more mundane growth. Finding vivid green while trying to get lost in Blue Canyon. We left a car at the bottom of Quatal the day before and camped out at Toad Springs overnight, so the only thing needed to start the day is to get on our bicycles and ride. Toad Springs has no toilets and no trash service, but there seems to be someone determined to just leave all their trash in the metal fire rings as though those are cans. Someone else left a big garbage bag loosely tied. No toilets means there are a couple areas around the camp that are full of old, used toilet paper. The few sites are surprisingly tight for a forest service campground. It will not be winning any awards for campground quality, but we have it all to ourselves. Overnight, there have been waves of hail. They were short and the actual dropping was not very heavy, but there is certainly some weather to pay attention to. The morning sky looks like it is clearing as the sun gets higher and the light strengthens. It must be right around freezing as there are some places where the hail is hanging around. The air is still and it feels quite comfortable. Bruce wants to let it warm up just a little, so we are leisurely in breakfast and get camp completely broken down and stowed away before starting off. 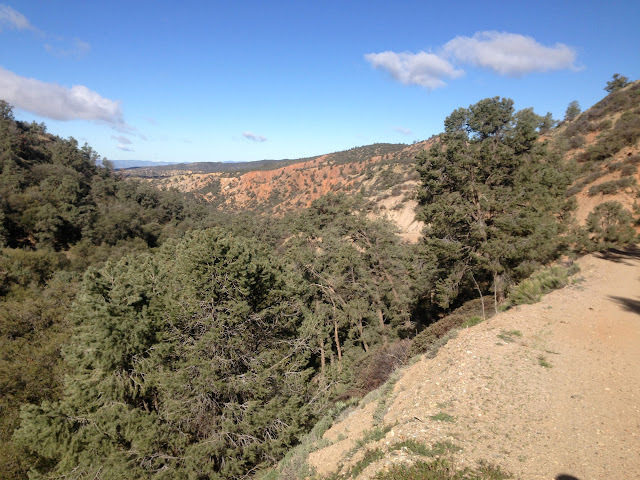 The start is steep (for a road) and tight in the canyon without too much views, but that soon changes. It must be a quarter mile in when I notice the missing camera. I left it on the floor of the car. It is about twice that when I want it. The whole ride would not be more than a few hours without all the expected stops to search for geocaches. That really slows things down, but also forces a moment to stop and look around rather than focusing on where wheels will be rolling in a moment. Among the pinons and starting to get a view down the canyon full of colors. Bruce took the photo for me with his phone. 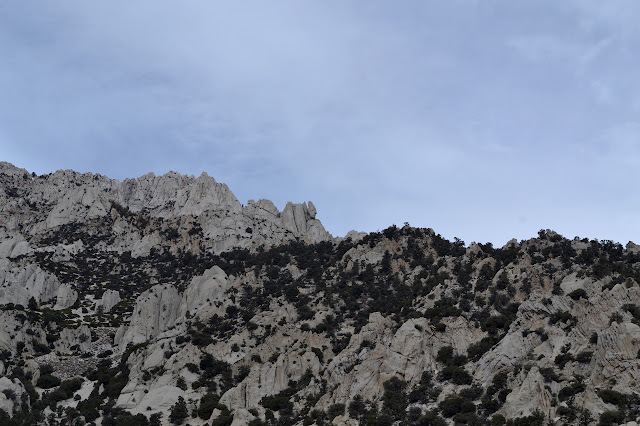 I am back at Santa Barbara Canyon, but this time without any keys, to see about reaching Cuyama Peak from the north. I do not really have any expectation of doing so as it is 13-14 miles to get there. The bicycle does not seem to be extending my range much for the day, but maybe it is the stopping for geocaches that is keeping my range down. Bruce is along again, and his goal is the geocaches. We are starting a little later than planned because his navigation thought it would be a good idea to go on the direct route on 9N11 from the highway, a route requiring high clearance, 4 wheel drive, and The Knowledge, rather than the longer route along Foothill which is almost entirely paved and easy to navigate even in your low rider. But leave your low rider, that stuff is only cool in the city and is quite the opposite out here. Besides the rancher taking a couple head off to their destiny and the rest wandering about waiting for their turn, there is no activity out here. Well, there is the wind too, blowing over carpets of yellow and bright green. It is a cool day, but it is decidedly spring. The carpets of yellow are too short for mustard. Up close, they turn out to be daisies. We pick our way past the gate and ride through the natural red rock gate of the canyon. It is an easy slope and actually rolls a bit for this first section. The rocks change quickly as we go. The canyon entry in panorama from the inside. The road ahead past some concrete pieces of unknown origin. The bike gives an opportunity for a two vehicle shuttle with only one car. In some instances, I might even be easier. 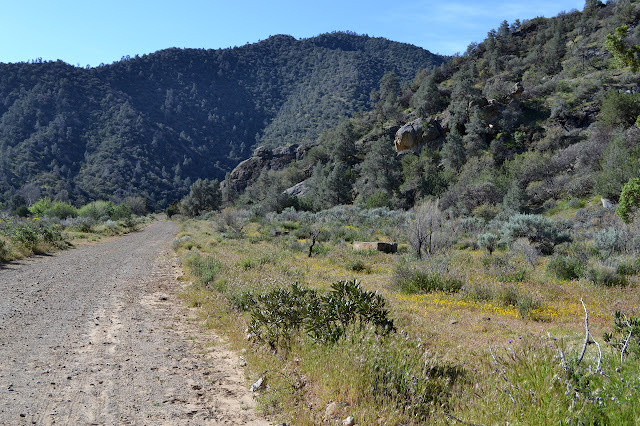 I decided to try it out in service of walking the whole of Blue Canyon and Forbush Canyon. So up the mountain with bike and pack and stopping at the saddle to drop off the first. Cold Spring Saddle gets a lot of traffic, so it needs to be out of the way and locked to be sure it will still be there. Then down the road past some joggers. The road has gotten rougher with the rains and there are a few land slides and a couple big rocks on it. It is a little better after the gate, but still has some bad spots. 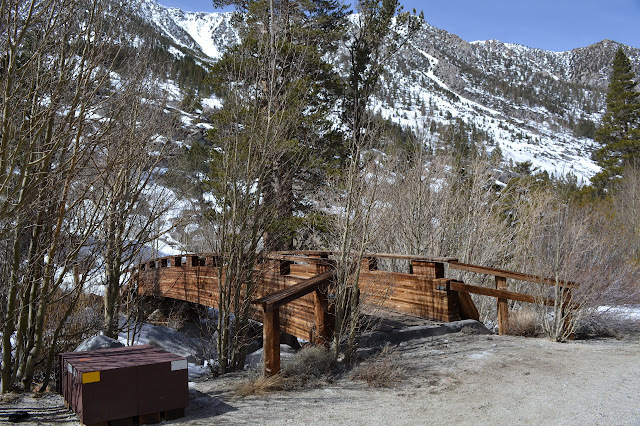 I am glad to see the bridge that serves as an easy landmark to find the upper trailhead for Blue Canyon. The road bulges quite a bit right after the bridge for trailhead parking and right in the middle of the bulge, a slapstick marks the top of the trail. I park right next to this and grab up my hiking gear. The bush poppies have started popping all over the place. I forgot to leave my helmet with the bike, but it can be latched easily to my pack and weighs almost nothing. With a little extra weight, I start down past a sign about the local turtles. The trail is green with stunted growth, but there are footprints too. It is not totally abandoned. It is level with the road, and I hear the joggers on the far side. 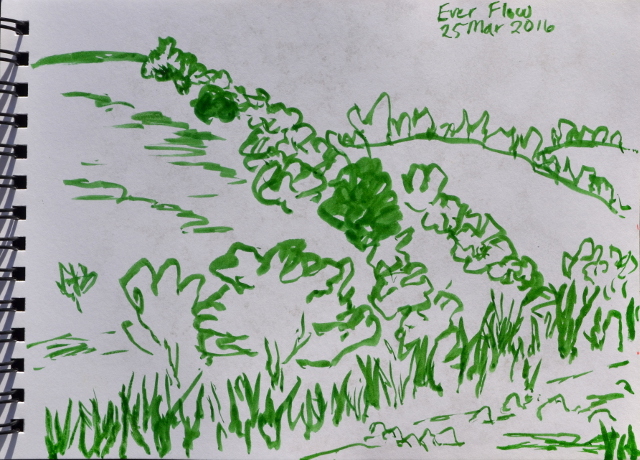 The leaves of woolly blue curls are pushing onto the trail all over and one is even starting to bloom already. 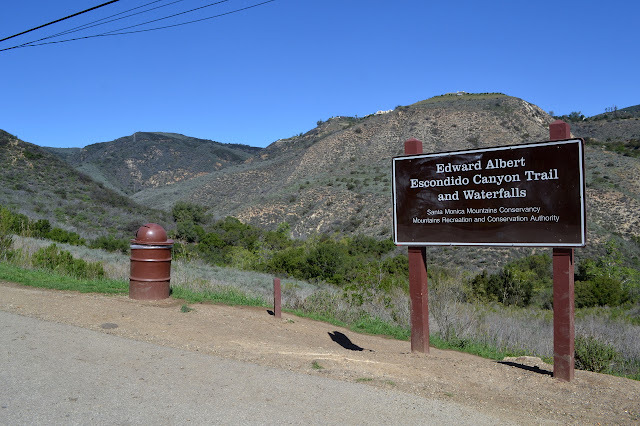 I can hear the water below as I pass Escondido Canyon. 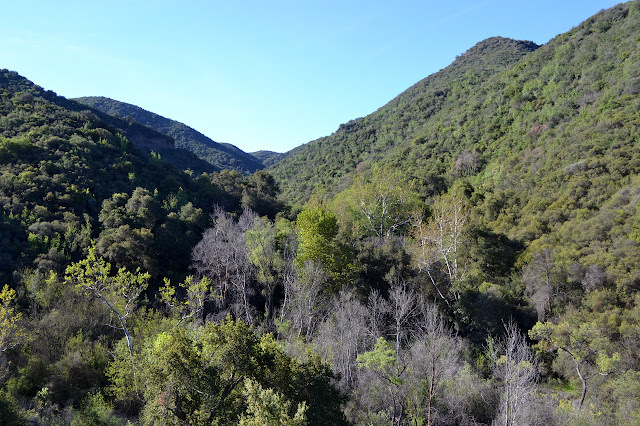 This seems to be where all the water comes from, but looking back, there are a few sycamores up the main canyon too. There is water there, somewhere. Looking down the canyon, there is the road cut on the left. And back along the rocky trail. We set our sights on South Lake for some actual snowshoeing. Well, I wanted Sabrina, where the highway ends, but I was overruled. We drive around a sign which would say "road closed" if turned the right way around, and start to hit snow on the road. Not too much further, it becomes a solid mass up the hill. Happily, there is a trail right next to where we have to stop that just happens to be quite covered in snow. Always nice when we do not have to wade through the snow melt on the first day of spring. We cross the bridge and strap the paddles to our feet on the far side. There are already a few prints to help with route finding. Unfortunately, there are a couple post holes to go with the prints where someone tried to walk it in runners. There are not a lot of routes available, but it is nice not to have to search for it. 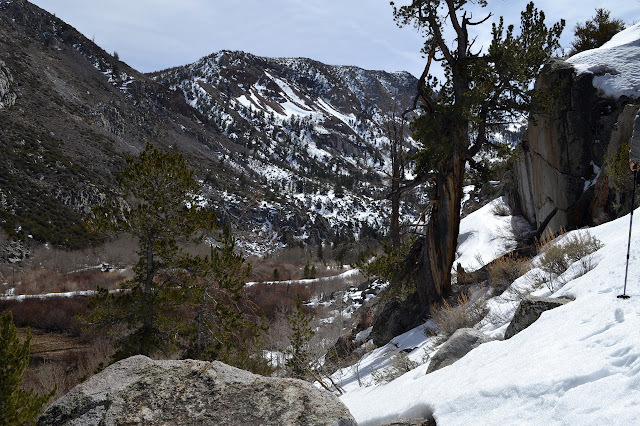 There is one patch of bare rocks after a few hundred feet, but then it is all snow. 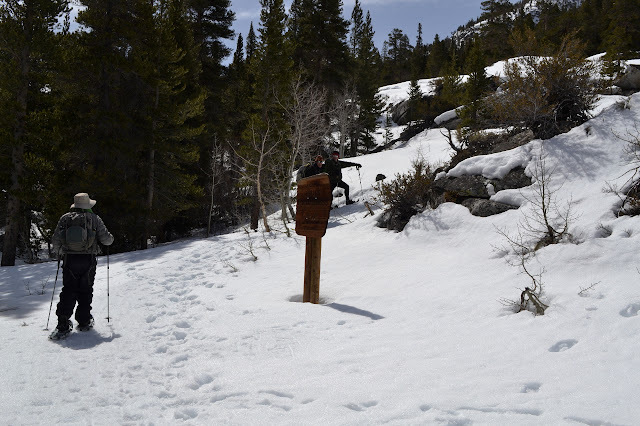 Entering the John Muir Wilderness and still on trail. I suggested a snowshoe up to the Ashram to Bernard and now we have collected a group to do it, although the snow is not cooperating. That is okay, this jagged valley is probably not a place one would want to be in heavy snow. We park in a turnout a little before the road starts to flirt heavily with a cliff and start our hike along it. 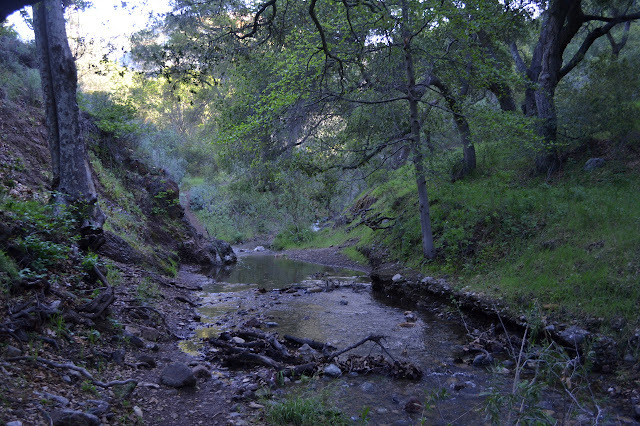 The creek that is a dry wash where we crossed to get here is noisy and invisible in its deep groove below us. The gash of this valley and the flat of Owens behind us is quite a contrast. Starting off somewhere above Tuttle Creek which slices the bottom of a large glacial valley. 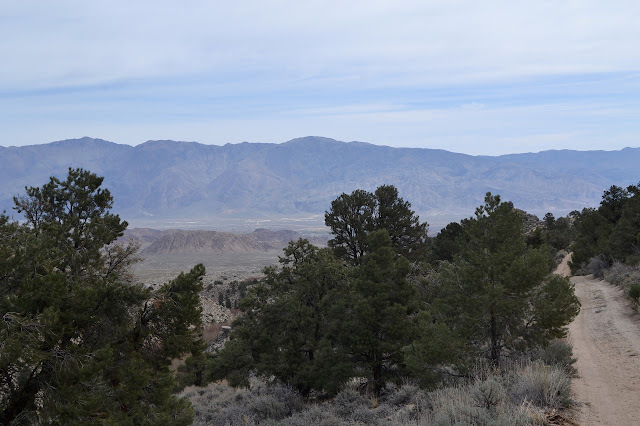 Looking back on Owens Valley. I see faces in the rocks, or at least a head on the ridge. 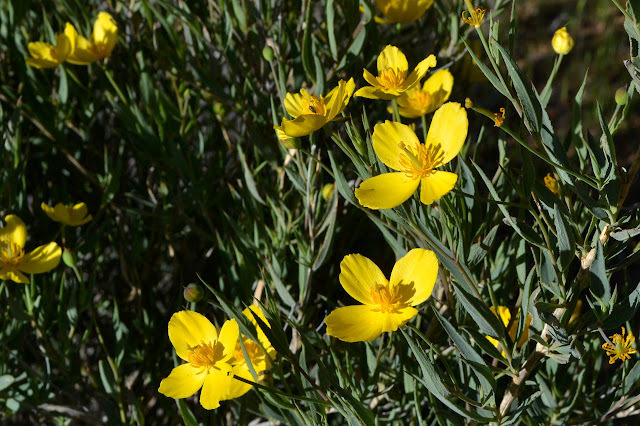 Spring is (nearly) here and one place that really does spring is the area around Figueroa Mountain. In particular, I have been hearing that Grass Mountain is spectacular. 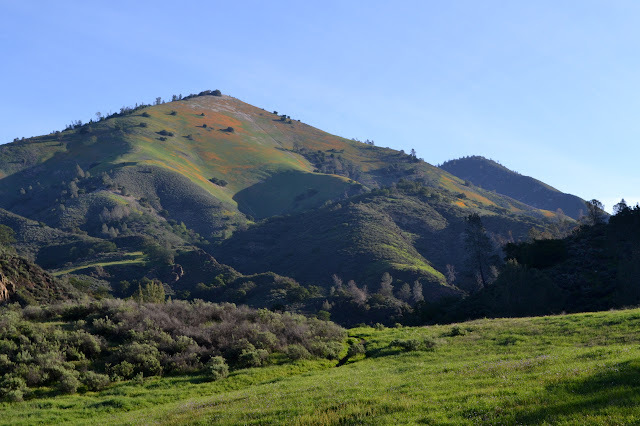 The slopes full of poppies really can be impressive and there is no slopes more impressive than the face of Grass Mountain, so I decided to brave the incredibly steep trail and see it for myself. Besides, I probably do not really need to get to the top to enjoy the flowers and I still want to find out what that witness post is witnessing. 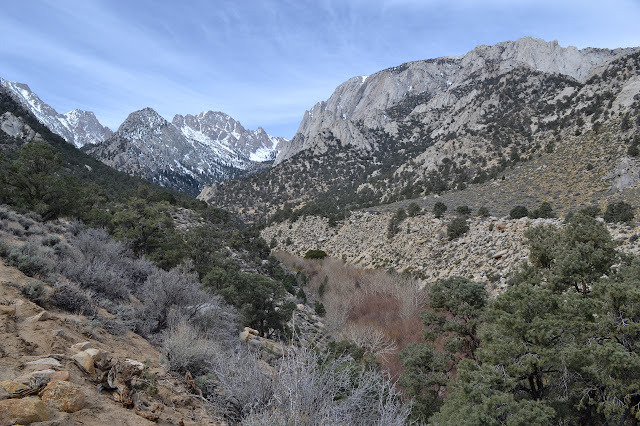 I grabbed the hiking permit from Midland School, since most of the hike is on their property and I need permission before going there even if it is automatically given. A first look at Grass Mountain. The orange splotches look alright and some areas could be impressive. Poppies can be slow to open up in the morning. The cold is biting down in the canyon as I start, but that will not last long. I grab a photo of the map sign for future reference as I will probably wander a bit after hitting the mountain and it will come in very handy then. The creek is running well. The first sighting of the mountain shows some orange splotches way up high, but the orange is not quite as bright as one might hope. Poppies close up at night and can be slow to open in the morning, so it may get brighter. There does not seem to be as much purple mixed in as I would expect. Lots of water coming down Birabent Creek. Winding my way up the trail beside the creek has a single quite steep spot, but is generally not hard. The one creek crossing is also easy. Past a second crossing of much smaller Maple as it comes in is the sign for Grass Mountain. I start to climb, and it is not long before I am passing through meadows of flowers. Blue dicks are the first seen in multitude, but it quickly gets a little more exotic. 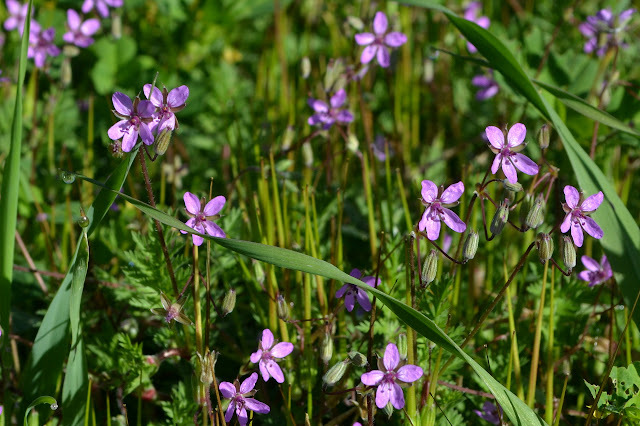 These little purple ones have a petal arrangement that makes me feel like they are hanging upside down. The waterfall is a short hike, so I planned to explore Charmlee afterward. 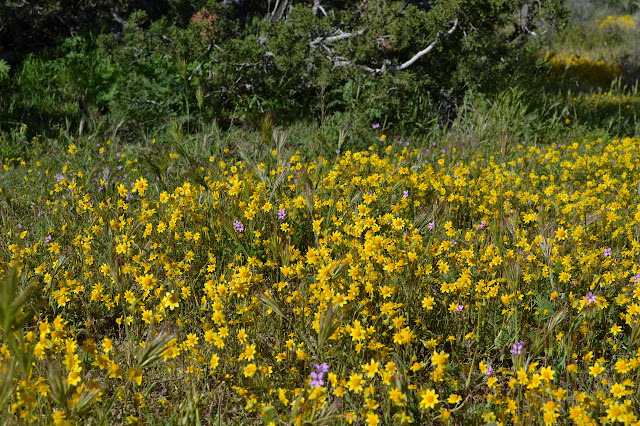 It seems to be quite a popular park and is a good place to find wildflowers. Parking is $4 in the lot and although there are numerous places to park outside the lot, most seem to use it. Beside the lot are bathrooms, a nature center, interpretive trail, picnic tables, water, and a map of the many trails that form a mesh over the hills. As sensible as it might be to start there, I do not. 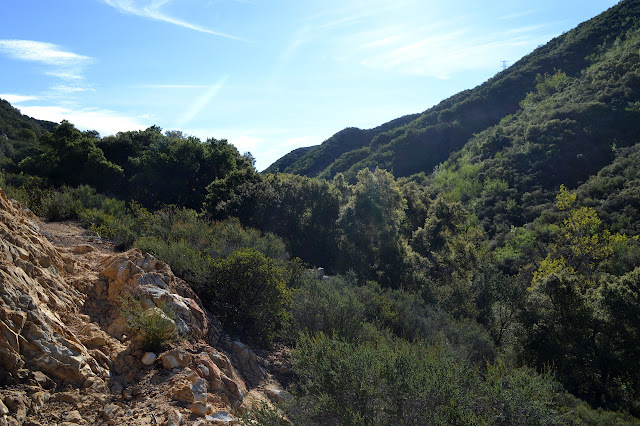 Instead, I head up the fire road for the very highest point first. Climbing high. Santa Catalina is still waiting out there. 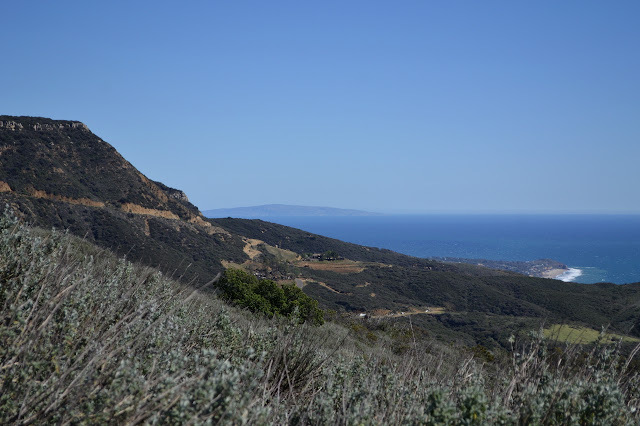 The view from high up in the park on down the coast with Point Dume and Point Vicente sticking out into the ocean. Behind, the Boney Mountain with all its peaks rises much higher. Seeing the creek that wraps around the north side of Sandstone Peak full of water has me thinking of the local waterfalls. Perhaps they are flowing nicely too. 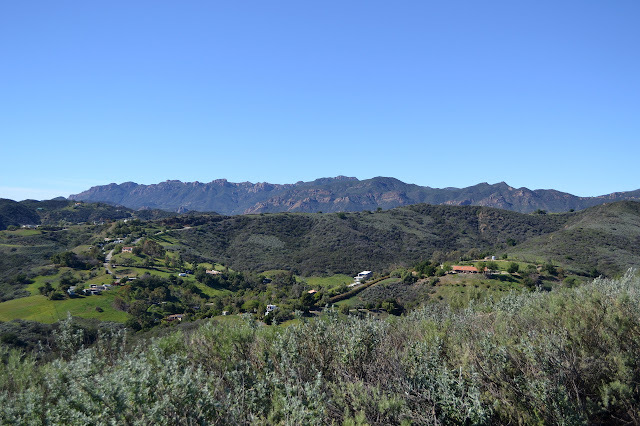 I have gone right for the grandest of them all in the Santa Monica Mountains, but not on a weekend. That would be madness. On a weekday, I can find a parking spot within the little lot although there are very few left. I get my feet into a pair of shoes I do not mind getting muddy and start up the signed trail next to the road. 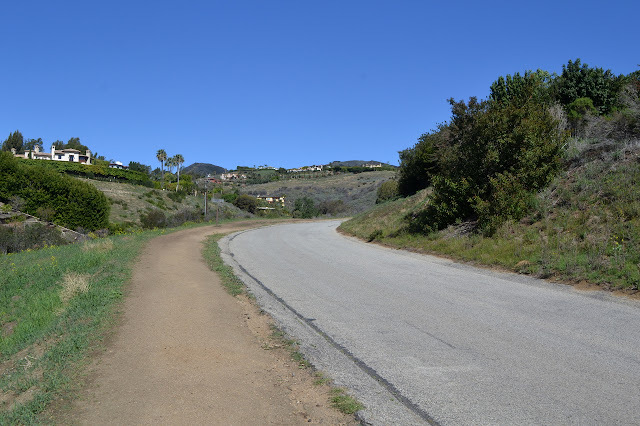 Well used trail beside the road to a few Malibu estates. 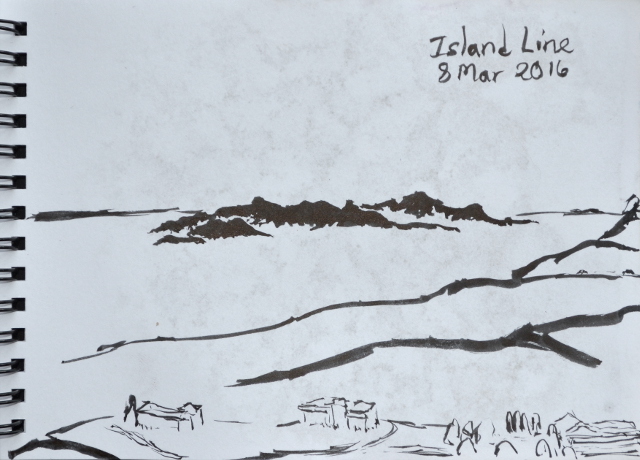 The islands are out today, even if a little grey with distance. 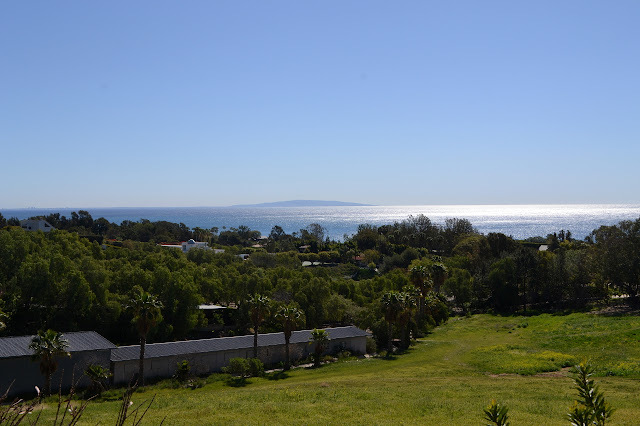 Large Catalina and smaller San Clemente and tiny San Nicolas or Santa Barbara are shapes upon the horizon. 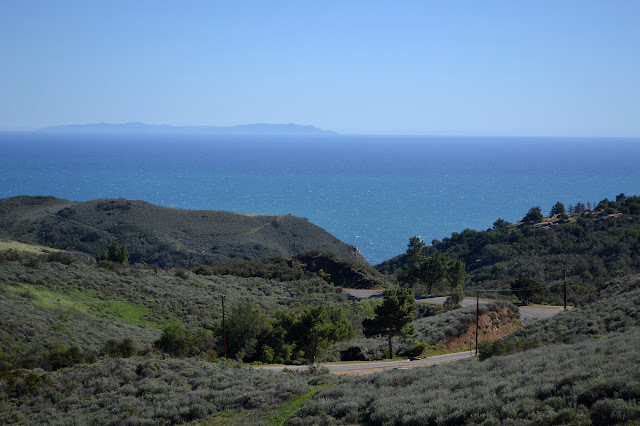 The other islands are hiding behind Point Dume. San Clemente Island over a long stable. Finally at the end of the roadside "trail" and ready for some mud. 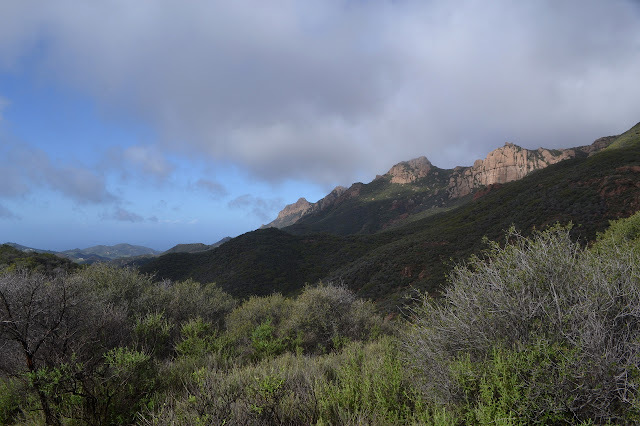 There was an offer out to join a group doing a shuttle hike up and over Sandstone Peak and out the bottom of Big Sycamore Canyon. 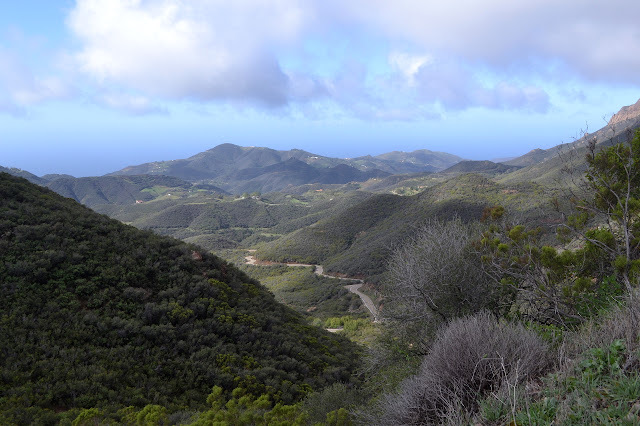 Do I really want to face the maximum downhill that the Santa Monica Mountains are capable of throwing at me, going from the highest point in the range to nearly sea level? Well, they are not all that high and there is nearly 15 miles to lose all that elevation in, so I grabbed my poles to help take on some of the impact and joined up. 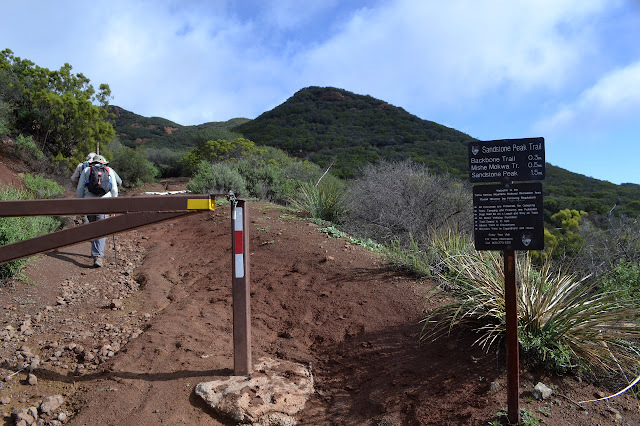 Making a start on the Sandstone Peak Trail. The Backbone and Mishe Mokwa Trails can be combined for a nice loop. The trail shows signs of erosion from the rains and is set with sandbags to form water bars. Today is a single day window between brief storms. The last one brought over an inch last night, but there is little mud on the trail. It is generally a little rocky and well drained. The mountains come quickly into view as we make the brief and only real climb of the day. Clouds make minor threats to the view from the top as we approach. Yerba Buena Road winds its way below showing none of the treacherous rock fall that presented itself as frequent obstacles on the way up.